Smudging is a very important Wicca ritual that has been utilized by Wiccans much in the way Native Americans smudge. A smudge stick is a bundle of herbs that are gathered together and tied. Smudging is the practice of burning the smudge stick for rituals. Smudge sticks can include a variety of herbs, sage being the most common. Burning a smudge stick is commonly used by Wiccans in preparation for casting spells or as part of a ritual. Herbs for creating smudge sticks can be gathered from your garden or even purchased from a wiccan supply store. The entire goal of the smudge stick is to make smoke, not a fire. It should burn much in the way that incense does, without starting a fire. There are safety precautions involved in handling a smudge stick because it can catch fire to your clothes or things around it, and it can set off smoke alarms if you are smudging inside. Like candles and incense, smudge sticks must be used with great care and caution. The goal of using the smudge stick is to have it release smoke from the herbs that is intended to purify and cleanse the air. You can carry a fire safe bowl or small cauldron under the smudge stick to capture any loose embers that are still burning as they can fall from the smudge. Wave the smudge around the areas that you wish to purify and cleanse. You can use your hand or breath to carry and dispurse the smoke. Wiccans often smudge to remove negative energy from an area they wish to purify. Often, a Wiccan will chant or meditate upon that which she intends to happen as she performs the smudging ritual. A Wiccan might use a smudge to clear negative energy from the home, or as a purification of the altar area prior to casting a spell. You can purchase premade smudge sticks online from a wiccan supply store that comes ready to use with a variety of herbs in them. 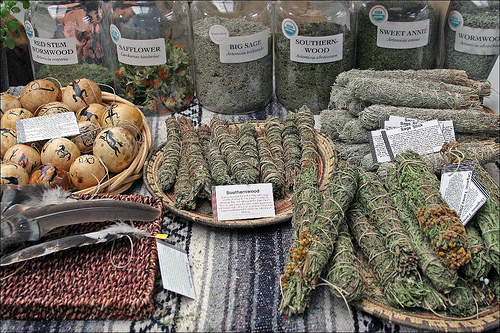 The beautiful photo shows one Wiccan supply store’s wonderful display of herbs and smudge sticks. Usually the smudge sticks have white sage and sometimes other herbs such as lavendar or cedar are added. Wiccans select each herb to go into the smudge stick with care based on what ever qualities they want to invoke with the smudge sticks. Posted on July 11, 2012 by admin. This entry was posted in Miracle Herbs. Bookmark the permalink. Curious? I thought they werent just for burning i was also read several articles about rubbing (smudging) your body or walls in home? My qyestion if your smudging yourself do you use the herbs like sage on your skin and what if you got to big of a house to physically smudge by hand? What is more effective? Smudgung without burning or burning? I know they are both great! If you could only pick one method what would it ne and why? Your feedback would be great!